Conan started off as a mercenary, some say he retained that mindset to the end. It's certainly a good route to adventure! Publisher's blurb: "The Hyborian Age is a time of incessant war. The armies of kings and queens cannot master the battlefield alone, and the task is left to those sell-swords who trade blood for coin. 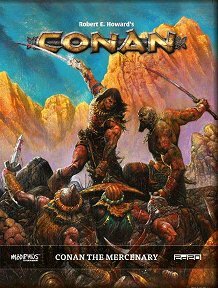 In Conan the Mercenary, the battle fields are yours to kill for, and to die on. "Join legendary mercenary companies, support revolts, or fight for the throne. It matters not the motive for war - gold is the wage for your blade. The jeweled thrones of the Earth tremble when mercenaries mass against them, and citizens pray to their gods when those selfsame killers are out of work and turn to banditry. In this age, the records of war and battle are mankind's only testament, and names are written on the annals of history in blood. "Join your dog-brothers and sword-sisters on the fields of battle, and take your pay in gold and glory!"